Forests are considered the lungs of the planet, as they consume and store carbon dioxide and produce oxygen. They have provided an economic foundation for growing nations, supplying wood for buildings, firewood and fuel, and land for expanding cities and farms. But population pressures are causing considerable environmental distress in even the most remote forest areas. 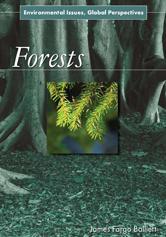 Case studies in Forests explore illegal logging in the Amazon rain forest, examine the effect of increased hunting in the Congo forest, and discuss encroachment on old-growth tropical forests on the Southern Pacific island of Borneo, among other issues relevant to the world's forests.